By Lisa Rein. Graphic by Todd Lindeman and Brenna Maloney. Cars crawl down Route 123 in the afternoon rush. Forty feet below them, giant machines and men wearing yellow hard hats begin their advance under Tysons Corner to bring Northern Virginia commuters their holy grail: a new subway. At $85 million, the half-mile tunnel is the costliest and most complex engineering feat of the 23-mile Metro extension to Dulles International Airport. It will be built while 3,500 cars and trucks cross its path each hour, while the Courtyard Marriott serves breakfast and guests swim in its pool, while hands are shaken over aerospace deals at BAE Systems. It will carry on under two miles of tangled utility lines that convey to Tysons everything from electricity to some of the nation’s most secret intelligence. As of Friday, after three months of digging and prep work, workers had hollowed out the half-mile tunnel’s first 18 feet. One wrong move and the foundation of an office garage could settle, a top-secret communique through the U.S. Army’s microwave tower right above the tunnel’s path by Clyde’s restaurant could be lost. When it opens in 2013, the first leg of the rail line will extend 11.5 miles from East Falls Church through Tysons to Wiehle Avenue in Reston. The tunnel, scheduled for completion in late 2011, will connect two of the four Metro stations in Tysons. Cerulli likes to say his project is the toughest part of the line. “But don’t say I said that, because the guideway is also complicated,” he jokes, referring to the elevated section, still 18 months off, that will carry the trains 55 feet above the Capital Beltway. 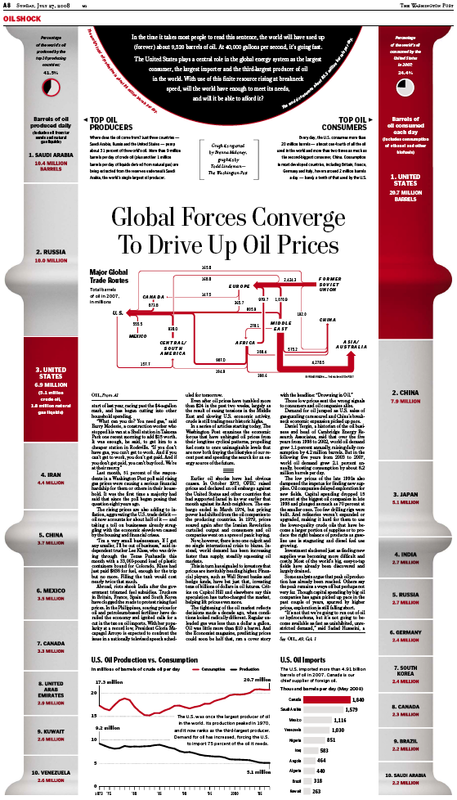 The Washington Post won 5 bronze awards in the Malofiej Infographics competition (SND Spain), including one for my interactive graphic District Taxi Fare Estimator published in January 2008. Read my post on how the interactive was created . . .
Reprinted from The Washington Post, July 27, 2008. In the time it takes most people to read this sentence, the world will have used up (forever) about 9,520 barrels of oil. At 40,000 gallons per second, it’s going fast. The United States plays a central role in the global energy system as the largest consumer, the largest importer and the third-largest producer of oil in the world. With use of this finite resource rising at breakneck speed, will the world have enough to meet its needs, and will it be able to afford it? Where does the oil come from? 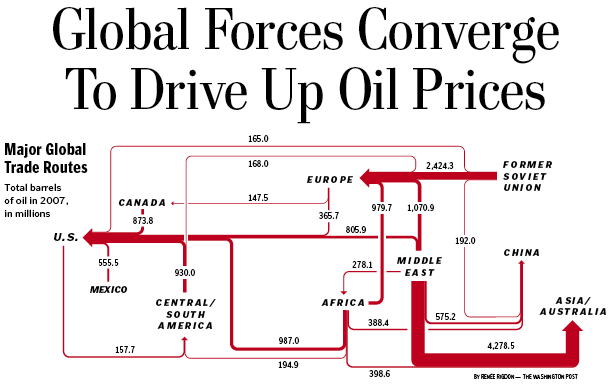 Just three countries — Saudi Arabia, Russia and the United States — pump about 31 percent of the world’s oil. More than 9 million barrels per day of crude oil (plus another 1 million barrels per day of liquids derived from natural gas) are being extracted from the reserves underneath Saudi Arabia, the world’s single largest oil producer. Every day, the U.S. consumes more than 20 million barrels — almost one-fourth of all the oil used in the world and more than two times as much as the second-biggest consumer, China. Consumption in most developed countries, including Britain, France, Germany and Italy, hovers around 2 million barrels a day — barely a tenth of that used by the U.S.
Screenshots below and above. Download PDF. Graphics reported by Brenna Maloney, graphics by Todd Lindeman — The Washington Post. Map by Renée Rigdon – The Washington Post. How did the most dynamic and sophisticated financial markets in the world come to the brink of collapse? The Washington Post examines how Wall Street innovation outpaced Washington regulation. How did the world’s markets come to the brink of collapse? Some say regulators failed. Others claim deregulation left them handcuffed. Who’s right? Both are. 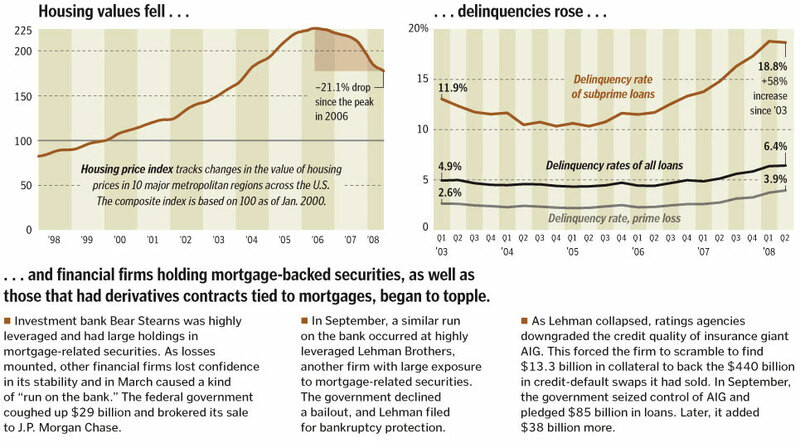 This is the story of how Washington never caught up to Wall Street. 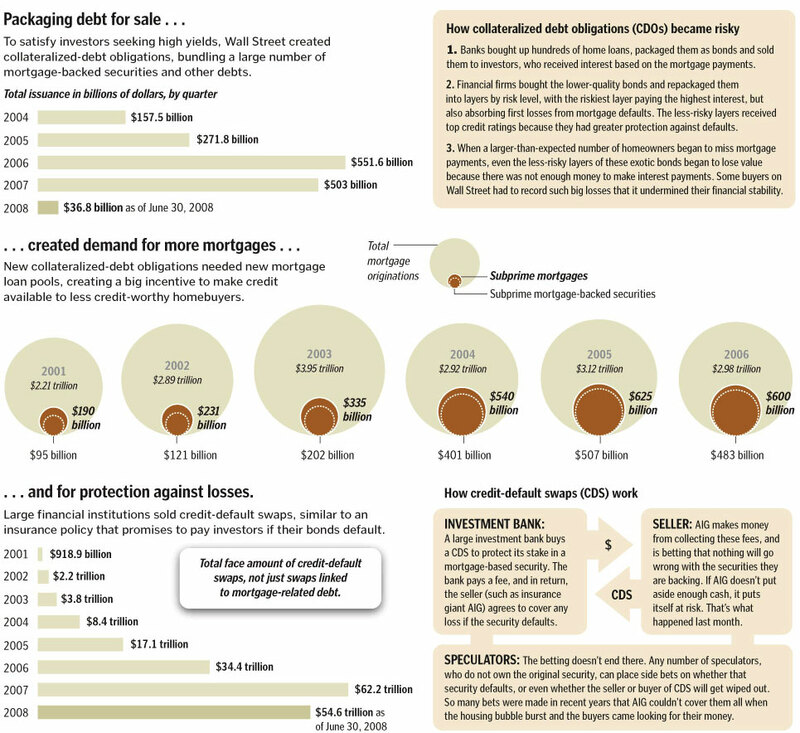 Wall Street devised exotic securities to earn fees from the debt boom. Click graphic to see full size version. Overburdened by debt, a relatively small percentage of homeowners began missing mortgage payments, creating a domino effect that sent losses throughout financial markets. Graphics by Brenna Maloney, Jill Drew, Ellen Nakashima and Todd Lindeman – The Washington Post – October 15, 2008. A mosquito doesn’t “bite,” of course. Its proboscis works like a syringe to draw out blood. The resulting itch is caused not by the piercing proboscis or the protein in the mosquito’s saliva but by the body’s immune response to them. By Brenna Maloney And Patterson Clark — The Washington Post. First published July 2007. See original.